In the video below Archbishop Walter Obare explains the start of the Evangelical Lutheran Church in Kenya, and provides information about the location of the dioceses, parishes and congregations. It is a good primer on the ELCK. 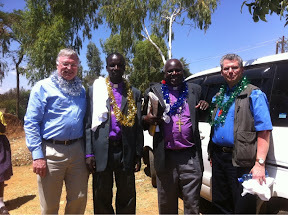 The ELCK began in Kisii in 1948 with the sending of Martin Lundström of the Swedish Lutheran Mission (SLM). The tribal group in this area are the Kisii (click here for a Wikipedia article on the Kisii). This territory today is known as the South West Diocese and was the first diocese of the ELCK. As of 2008, the South West Diocese had about 25,000 members. The second diocese of the ELCK is the Lake Diocese on Lake Victoria. The tribe from this area is predominately Luo (click here for a Wikipedia article on the Luo people). As of 2008, the Lake Diocese had about 10,000 members. The third diocese of the ELCK is the North West Diocese. This region of Kenya was primarily evangelized by the Norwegian Lutheran Mission among the Pokot people (click here for a Wikipedia article on the Pokot). 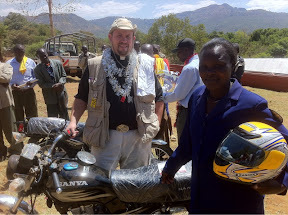 The majority of the Christians in this part of Kenya are Lutherans, followed by the Anglicans and the Roman Catholics. As of 2008, the North West Diocese had about 25,000 members. The fourth diocese of the ELCK is the Central Diocese which boarders the other three and is the largest geographic diocese. As of 2008, the Central Diocese had about 12,000 members. The fifth diocese of the ELCK exists constitutionally. It is the Cathedral Diocese located in Nairobi. It is the Archbishop’s diocese. 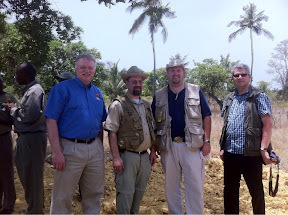 The total size of the ELCK is between 75,000 and 100,000 members with about 130 pastors. 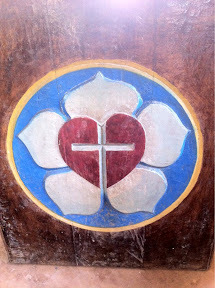 The ELCK has been shaped by five mission societies primarily from Nordic countries: Swedish Lutheran Mission (SLM), Swedish Lutheran Evangelical Association of Finland (SLEAF), Lutheran Evangelical Association of Finland (LEAF), Norwegian Lutheran Mission (NLM), and World Mission Prayer League (WMPL). These groups all have different cultural backgrounds, philosophies on how to conduct mission, various views on the liturgy, laity, ordination, and the clergy. It makes for an interesting mix. Most recently, as of 2003, the LCMS has been involved as well. 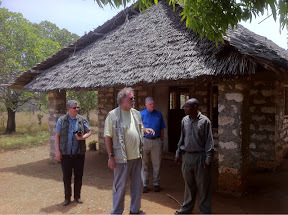 On our trip in Kenya this past week, we visited Mombasa, Wema, Nairobi, Kisumu, Eldoret, Kitale, Kapenguria, and Chepareria. The only region we did not get to see was the northern region where the drought is occurring. 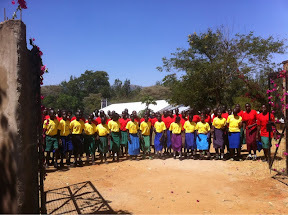 Pictured above are the boys at the Othoro Rescue Center. Currently, there are about 58 boys housed here. The center has broken new ground to expand so that 100 boys can be housed at the center. Roger Weinlaeder speaks about the LCMS and ELCK partnership in Project 24 and 1001 Orphans. 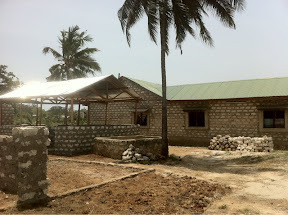 The Othoro Center along with Udom Rescue Center are two of the model centers for orphanages in the ELCK. 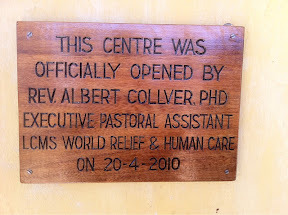 The Othoro Center was constructed as a partnership between LCMS World Relief and Human Care and Project 24 in 2006. 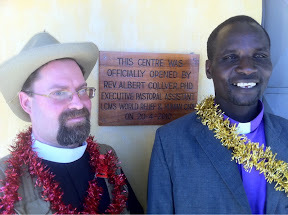 The Othoro Center was dedicated by Rev. Matthew C. Harrison in 2006, when he served as the Executive Director of LCMS World Relief and Human Care. As with most of the ELCK’s orphan centers, there is a congregation located on site. Archbishop Obare many years ago served at the Othoro parish. The 1001 Orphan Program is more than “human care.” The orphan program run by the ELCK cares for the entire person, body and soul. The children compete in Bible clubs to creatively learn the Catechism. The video below is a short excerpt demonstrating how the children learn the catechism. We heard several groups of children recite the catechism in creative ways. It was amazing to see the children compete with one another over the catechism. The children at the Udom Chepareria Rescue Center gave us a warm greeting of song when we arrived after a 2 1/2 hour drive from Eldoret. 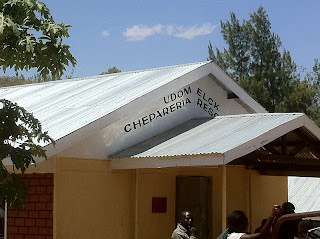 The Udom Rescue Center is in the territory of the Pokot Tribe. In Kenya, Christianity among the tribes has expressed itself primarily as Anglicanism or Roman Catholicism. In the Pokot Tribe, the majority of the Christians are Lutheran. In fact, the Anglicans and the Roman Catholics look to the Lutherans for social care, etc. Bishop William Lopeta oversees the pastors in the North West Diocese. The view from the Udom Rescue Center is gorgeous. Here is a view of the new dinning hall. After visiting the Udom Rescue Center, we drove for 6 hours to Kisumu. Today, we will visit sites around Kisumu including the first rescue center the LCMS assisted the ELCK in Othoro, named after Matthew Harrison. Last night, we checked into a hotel, the Sunset Hotel, on Lake Victoria. Below was the view from my window this morning. I had hoped to share more photos today, but even with the hotel internet, the uploading of the two short video clips took well over an hour. Time to hit the road in the environs of Kisumu. The Udom Chepareria Rescue Center is a partnership between the ELCK and the LCMS, including 1001 Orphans, Project 24, LCMS WR-HC, and Concordia Lutheran Ministries. Currently, the center has about 62 children in the program with the capacity for 30 more children. This center is located about 2 1/2 hours away from Eldoret. Collver with Bishop William Lopeta, Bishop of the Northwest Diocese. Unfortunately, I did not make the dedication in April due to the volcano in Iceland. Evangelist Wilson said that it is the task of Christ’s church to care for the entire person, both the body and the soul. 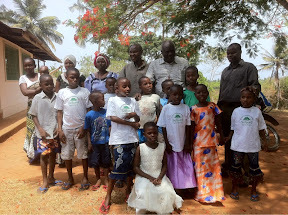 This rescue center takes care of the material needs of the body, food and shelter, and Christian education consisting of the Bible and Small Catechism along with church attendance. A church that will hold about 800 people is being constructed on the site of the center. 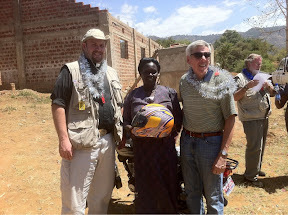 Concordia Lutheran Ministries donated motor bikes to the deaconesses so that they can visit the children more easily. Deaconess Grace (pictured here) travels more than 200 kilometers to see the children assigned to her. The motor bike will make her job much easier as she no longer has to rely on public transportation. 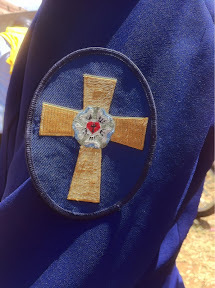 The deaconess symbol for the ELCK has the Luther Rose on it. Districts President Fondow and James Baneck are pictured with Bishop Lopeta and Archbishop Obare. I hope to post more about the Udom Chepareria Rescue Center with video later once a faster Internet connection can be found. 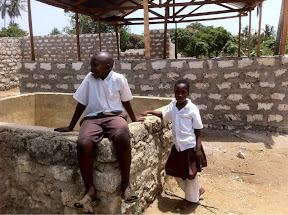 Here is an update from a Project 24 and 1001 Orphans. 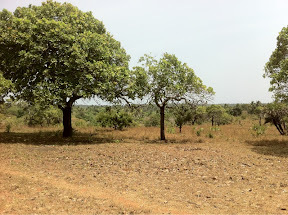 The Ukanda Project 24 site is pictured here. This site should be fully operational by April 2011. Currently, a few children are living here. Project 24 focuses on bricks and mortar, building the rescue centers. It is a partnership with LCMS. 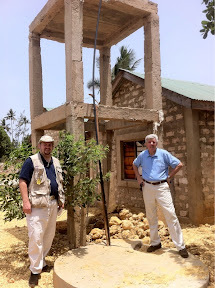 Pastor Jamison Hardy and Jim Wolf from Concordia Lutheran Ministries, sponsors of 1001 Orphans stand near a well funded in part by CLM people. After visiting Ukanda, we went to Wema station where 21 children, who are sponsored by 1001 Orphans stay. The Wema station is within 10 miles of the Indian Ocean near Mombasa. The area has a high Muslim population. One of the pastors who serves in this area had been born a Moslem and after he converted to Christianity suffered repeated beatings and nearly died. Now he serves as a Lutheran pastor. 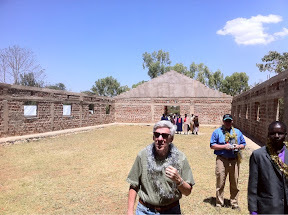 On the Wena compound is a Lutheran church that the children attend. Pictured on the calk board is the Ten Commandments. 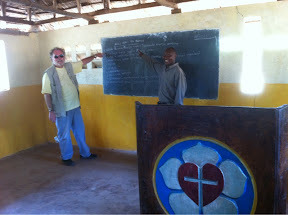 Bernie Seter, chair of the Board for International Mission, stands with Evangelist Emmanuel. The pulpit at the church in Wema. District Presidents Jim Baneck and Don Fondow stand with Bernie Seter and Emmanuel. View out of the church’s front door. There is no electricity or running water. Water is manually pumped and carried up the hill. The generator that powered the pump has broken so the small plot cannot be irrigated for the crops. 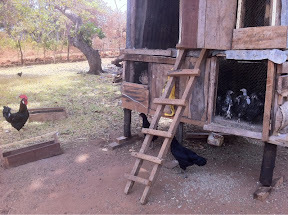 A small chicken coop also sits on the site. The rooster seemed alarmed that I would approach the coop. Now we are off to the airport to travel to Eldoret located in the northwestern part of Kenya. Will update as the Internet is available.